Library Commons is a unique, intimate community of luxury townhomes and single-family homes situated in downtown Boca Raton. 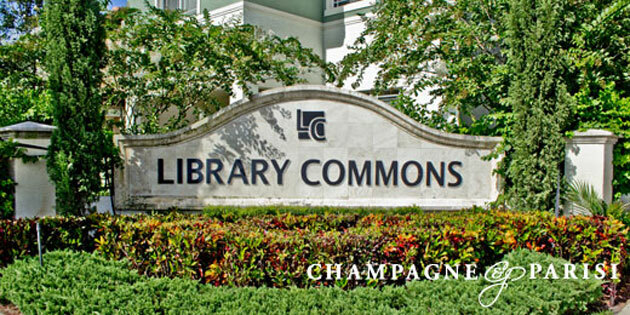 Inspired by the charm & character of Mediterranean village, Library Commons is located on NW 2nd Avenue, (Boca Raton Blvd. ), two blocks north of Palmetto Park Road, in the heart of Boca Raton. Developed by Lennar Homes, there is truly no community as original and as eclectic as Library Commons. Comprised of 85 residences, Library Commons offers a diverse collection of single-family homes and townhomes, with a variety of unique architectural details of Tuscan, Classical, Mediterranean, or Spanish available to choose from. The amazing residences boast 2 and 3 story floor plans and range in size from 2,000 square feet to 3,000 square feet. These homes feature 2 and 3 car garages, and some residences even have private pools. However, all of the homes in Library Commons offer stainless steel, Deluxe GE® kitchen appliances, granite countertops, custom wood cabinetry, Listello decorative tile in the modern baths, and impact-resistant windows and doors. Every residence is specifically laid out to provide walkways and gardens to further enhance the elegance of this serene neighborhood. One of the perks of living in Library Commons is the community's outstanding location, which offers residents easy access to some of the area's best amenities & attractions. Just minutes away from the neighborhood are the wonderful South Florida Beaches and several community Parks, as well as a variety of incredible dining venues, some of which are located at the popular Mizner Park. The Boca Raton Resort & Club, Gumbo Limbo Nature Center, Boca Town Center Mall, Boca Raton Museum of Art, & iPic movie theaters are also all within a short driving distance of the community. The Library Commons community is also zoned for some of the area's top-rated public schools, including J.C. Mitchell Elementary School, Boca Raton Community Middle School, and Boca Raton Community High School. Unlike its name suggests, Library Commons is anything but common. With an unsurpassed location, a gorgeous selection of unique homes, and a picturesque, intimate atmosphere, the Library Commons community is truly a one-of-a-kind. If you would like to learn more about Library Commons homes & townhomes for sale, please contact us at 561-998-9015. You may also reach us by completing the brief online contact form provided below and one of our expert Boca Raton Realtors will reach out to assist you. We at Champagne & Parisi Real Estate look forward to assisting you will all of your Boca Raton real estate needs!